Few places in Australia offer such contrasting cultures quite like Brisbane. The capital of Queensland has long been the hub that ties much of the east coast together. It serves as a middle point between other major destinations, and as a result, experiences quite the influx of traveler’s. It’s no surprise then that even a traditionally ‘business-styled’ city like Brisbane is not lacking when it comes to friendly, free-flowing urban styles and leisure aesthetics. Gifted with an already robust and sophisticated city population to begin with, the city—with its myriad assortment of fine commercial establishments—is quick to recognise the potential customer in the transient traveler. That is why a welcoming visual environment that exudes both class and quaint sensibilities is important. And let’s not forget the equally-important need to tie in two of the city’s most inviting features—overall good year-round weather and a charming outdoor environment. The conscious effort to achieve this ‘urban-outdoor’ aesthetic in the city has never been more exemplified than by the near-ubiquitous use of window awnings for commercial establishments. Bars, dining-joints, office buildings, and leisure centers, all make use of this nifty and stylish accessory. Accentuating windows with tastefully colourful designs is the new fad among business owners. Window awnings Brisbane style is best described as treading the line between urban and suburban flavours. For commercial establishments like restaurants and small styled stores, popping an awning on top of your windows is a good idea. Apart from the obvious functionality that an awning provides in terms of shade and protection from the elements, eye-catching designs from manufacturers like Coastwide Shade Sails can really promote visibility and add an impression factor. Pastel colours are suitable for bistros and other establishments that are expected to exude ‘a touch of class’; while more vibrant colours are recommended for beach-front and near-boardwalk stores, and also if you want put out a more ‘fun’ vibe for your store front. Traditionally, Queensland is known for its sunny weather, especially on the Gold Coast which needs waterproof shade cloth for sale. But like all the states that are situated in the sub-tropical climate zones in Australia, it also has a period of incredibly pronounced wet seasons. Monsoon season typically begins in November and continues throughout Christmas all the way to March. Locals will attest to the high humidity and frequent rainfalls. Naturally, this wet weather causes a handful of problems for the general public. Outdoor areas like yards, patios, driveways, and verandas are first to feel the onslaught of the monsoon rains. Outdoor furniture is damaged, and all outdoor activities are suspended. What a hassle! Thankfully, the same shade sails that protect us from the heat of the sun do an equally better job of protecting us and our stuff from the pouring rain—that is, if those shade sails are provided by reputable and experienced manufacturers like Coastwide Shade Sails. The waterproof shade cloth used by us here at Coastwide Shade Sails offer the very best in quality, design, and price. The fabrics used are made from industry recognised, commercial grade fabrics. The vinyl option is also of excellent caliber, made from only the highest grade vinyl. Both are suitable even for heavy duty applications and tension structures. The waterproof aspect offers a unique and reliable layer of protection during the monsoon season, just as their 99% UV-R protection protects from the harmful rays of the sun during dry season. The fact that every fabric used has a 10-year warranty from the manufacturer is a testament to their confidence in the product’s durability and reliability. Whether it’s a mild drizzle or a heavy downpour, the waterproof shade cloth of Coastwide’s Shade Sails will never fail to protect you and your property from being drenched. Once you install these shade sails in your outdoor areas, you’ll rarely be bothered by wet weather again (or overly-sunny weather for that matter!). Property owners agree: whether it’s a private home, a commercial structure, a business location, or a dining joint with al fresco options, the least utilised and the most wasted part of the property can be the outdoor area. The sunny disposition of its dry season and the relative mildness of its showers during wet season make Queensland the ideal place to experience the awesomeness of outdoor activities amidst a pleasant sub-tropical climate. It’s no secret that to those who can find the proper shade, picnics, al fresco dining, and relaxing out in the open air are some of the most worthwhile activities. Backyards, community outdoor areas, patios, and spacious frontages are there especially for that reason. But when the midday sun fries your skin, or the occasional drizzle spoils your spread and ruins your clothes, it can be easy to just surrender to the elements and cross out ‘outdoor fun’ on your list of things to do on the Gold Coast. It’s fortunate that outdoor shade sails have become more popular over the years. Experienced manufacturers like Coastwide Shade Sails are leading the way in providing the public with affordable, customisable, stylish, and robust shade sails perfect for taking back the utility in backyards, patios, and other outdoor spaces. These outdoor shade sail patio accessories are perfect for protecting families, outdoor furniture, and outdoor spreads from either the heat of the sun or the drizzle of a cold shower. Treat loved ones for a cool and fun picnic underneath one of these installations, or look for a restaurant that has an al fresco section underneath these colourful fabrics. During the rainy season, enjoy a respite from the occasional drizzle by installing a shade sale in your back or front yard. The wide array of available colour schemes and designs make it virtually impossible to not match perfectly the overall aesthetic of your property. Coastwide Shade Sails are made using a commercial grade knitted fabric manufactured using a combination of high density monofilament and tape. This ensures that each fabric is imbued with the robustness necessary for overcoming most weather conditions all throughout the year. If two words could describe a typical fun day they would be sunny and sophisticated without Awnings Blinds Gold Coast. This bustling capital of Queensland boasts year-round outdoor adventure coupled with colorful and creative hotspots that are sure to interest anyone’s visual senses—tourist and locals alike. Much can be said about the visuals of this city, but the ‘sunny’ side of Gold Coast presents a unique yet mostly under-appreciated problem that most locals face. Whether one owns a residence or a commercial establishment, locals are all too familiar with the glare and intensity of your typical Gold Coast sunny day. A little exposure is fine, even fun—but as anyone knows, too much of one thing can be bad for you. Oftentimes the midday heat is less than welcome; during a nice lunch at a picturesque outdoor location, or when work has to be done inside the office, or simply when taking a break from the hot summer day. These times, people would rather have shade than sunlight. Coastwide Shade Sails has the perfect solution for a busy and bright city like Gold Coast. Boasting perhaps the most vibrant and colorful Awnings Blinds Gold Coast due to their unique designs and manufacturing know how, this specialised shade provider has been answering the problems of local residences and establishments in Queensland for over twenty years; providing expertly-made, high-quality awnings and blinds that offer overall protection from the heat and glare of the sun. Designs come in all shapes and sizes: from café-style rope and pulley systems, to spring-loaded systems, to automatic systems, to track systems—all tailored to specific customer needs. These not only protect from the elements—like sunlight, wind, and rain—but also ensure privacy in your personal living spaces. Coastwide awnings and blinds, with their aesthetically pleasing and vibrant designs are the perfect fit for anyone in Gold Coast. Nothing but the best quality would suffice for a city that offers high-quality fun. Is the ugly glare on your television screen getting on your nerves? Concerned about neighbours or passers-by peeping into your household? Worried that the harsh Queensland sun entering your home will damage your furniture and your family photographs on display? Then you need to start considering installing awning frames and outdoor blinds or shade sail Gold Coast. Awning frames or outdoor blinds, like the ones from “Coastwide Shade Sails, can be outfitted to your home’s porch to give you that privacy and the power to control the amount of light streaming into your home. 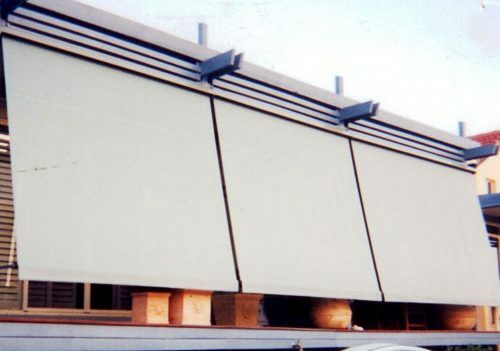 Awnings and blinds are designed to block direct sunlight when closed, and allow full light to enter when rolled open. Coastwide Shades offer different types of systems that will allow you to adjust your shades and blinds. We can customise and install rope and pulley systems, auto with arms and guides, spring loaded pull up and down, and tracking systems. Not only do awnings and blinds maximise your home’s outdoor space, keep out the unwanted UV rays into your interior, but they are also easily operable and adjustable. Additionally, Coastwide Shade Sails’ awnings and blinds present various light-filtering treatments for your home. Although you want to keep out harsh glares from the sun, you may still want a bit of natural light sifting through your windows. Coastwide Shade Sails offer Somerton View woven awning mesh or Somerton Acrylic semi block-out canvas that would be ideal if you prefer awnings or blinds that allow a certain amount of light in. These types of materials protect your rooms and family members from harmful UV rays, but also still allow a comfortable amount of natural light. If you want to completely block out sunlight, then they also have Somerton block-out canvas and tinted PVC. Awning frames or outdoor blinds are not only cost-effective, they can also delightfully complement your home’s windows or patios. Coastwide Shade Sails even offer Café Style awnings on rope and pulley that will give your porch that classy bistro look feel. Coastwide Shade Sails’s awnings and blinds also come in different trendy colors. In many cities of Queensland such as Brisbane, owning either a shade sail or an awning gives an impact not just to the people from protection under the sun, but also the things we want to take care of such as plants or the longevity of the color of the house and such. Owning or buying shade sails is not only for houses but also good for businesses such as restaurants, resorts, and garden centres. In restaurants it enhances the ambiance and comfort of the guests while protecting them from UV rays. Awnings, on the other hand, are mostly used by commercial businesses for entrance canopies, covered walkway solutions, or back-lit sign awnings. Commercial awnings are a great way to gain exposure for one’s business. It provides a professional appearance while promoting the business. Just like shade sails, awnings provide great weather protection, and give identity or decoration. Awnings can be seen on large chain stores, banks, and other franchise companies. People have come to expect more from hotels than from other temporary lodging establishments like motels, bed and breakfast inns, or lodging houses and forget about outdoor shade structures. They enjoy a better reputation when it comes to delivering quality services and an ambiance of luxury and leisure. The height of leisure, at least for most people, involves either beach fronts or pool areas, and novel experiences exemplified by alfresco dining or garden luncheons. These vacation staples are what tourists seek and have come to expect from hotel stays anyway, and most hotels are obviously happy to oblige. Present as a welcome accessory and an object of function in these leisure activities, the common hotel occupant would find these large, 4 to 6 meter, outdoor umbrellas conveniently placed along the poolside or over dining tables. These outdoor umbrellas or ‘shade’ umbrellas come in different colors and fabrics—whatever best fits the aesthetic of the establishment. These sturdy but versatile shades offer a cool respite from the sun, especially during the midday. But not all outdoor umbrellas are created equal. Coastwide Shade Sails supplies unique and customizable outdoor umbrellas that are made out of a top quality UV stabilized acrylic canvas topped with industry-recognized commercial grade fabrics from Somerton, Innova and PVC Vinyl from Valmex®. These also come in a wide variety of colors like heritage green, cappuccino, and burgundy, and (the fabric-made umbrellas) are twin-needle sewn to ensure durability and minimize the risk of tears. The umbrella frame, as well as the main pole, is made from hot dipped galvanized steel—very durable even against the occasional strong winds. These commercial umbrellas are among the best when it comes to form and function, and are the best choice for hotels. The city of Gold Coast is second most populous city in the state of Queensland. This prosperous haven of Australian culture and tourism is where both local and foreign people converge to get a taste of beach and surfing culture, as well as its perfect sub-tropical climate that virtually guarantees warm sunny days all year round and need Awning gold coast. This coastal paradise averages 245 days of excellent sunny weather yearly: a perfectly agreeable condition for tourists wanting to get a little tanning done along with their fun. But too much of these sunny days may in fact be detrimental, or at least cumbersome, to the everyday lives of the locals. Nobody wants to work in an office where the sun shines at full blast into your window early in the afternoon, no matter how ridiculously cold your air conditioning system is. Luckily, awnings are never in short supply in the city of Gold Coast. Awnings, or overhangs, are fabrics or coverings attached to the exterior wall of a building, usually above a window, to provide adequate shade from the sun and the other elements. Most awnings are made out of acrylic or cotton, but some are woven out of UV resistant polyester mesh, like the Somerton® View awnings made by Coastwide Shade Sails. The company has over 20 years of awning and shade sail manufacturing experience, which can be seen quite clearly in their products’ designs, patterns, sewing, and high frequency welding. All of these premium features are also offered at very affordable prices, making Coastwide Shade Sails the best place to find affordable awnings Gold Coast.